Staff from mainland China quietly took up their posts at a new high-speed rail station in Hong Kong Tuesday in a move criticised by opponents as giving away the city's territory. Hong Kong enjoys rights unseen on the mainland -- including freedom of speech -- as part of a handover deal between Britain and China, but there are fears those liberties are increasingly under threat from Beijing. 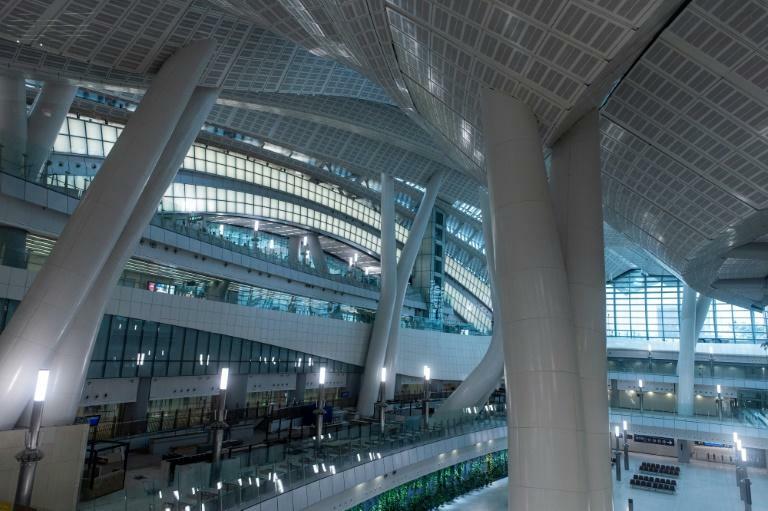 The new rail link between Hong Kong and southern China will see joint immigration checkpoints at the West Kowloon terminus, in the heart of the city, with a special port area patrolled by mainland security and subject to Chinese law. The station will officially open on September 23 but the mainland section was handed over to Chinese personnel in the early hours of Tuesday. The hush-hush ceremony took place at midnight and was not announced by the Hong Kong government until it was over. There was no media access. City leader Carrie Lam denied the move was a cover-up, describing it as a "working level handover procedure". "There was nothing sneaky," she told reporters on Tuesday. The government put out a statement just after midnight confirming that the secretary for transport and a senior official from the southern Chinese province of Guangdong had jointly hosted the ceremony to "mark the commissioning of the mainland port area" at the station. Under Hong Kong's mini-constitution -- the Basic Law -- China's national laws do not apply to the city apart from in limited areas, including defence. Pro-democracy lawmaker James To accused the government of downplaying the significance of the mainland personnel's arrival. "It should be a historic event, but they are very shy -- they didn't even invite the media to take the photos," he told AFP. To described the stationing of mainland staff on Hong Kong soil as "very controversial" and a threat to the city's autonomy. Both the port area and train carriages will be subject to Chinese law, prompting questions over how Hong Kong citizens will be required to behave in those zones, whether they will be punished for using Facebook and Twitter -- which are banned on the mainland -- or targeted for wearing clothing with political slogans. Residents walking near the station -- which is still sealed off to the public -- were split over the arrangement. A retiree who gave his name as Mr. Lau said the government was being disingenuous. "Authorities forcefully insist it doesn't violate the Basic Law but anyone with a discerning eye can see that's problematic," Lau told AFP. Another resident who gave his name as Li was more philosophical. "To be honest, Hong Kong has already been handed over to mainland China," he said.